I’ve been getting highlights of some sort in my naturally light brown hair since I was 13. That’s nearly 18 years of my life color treating. As someone with Latin heritage, even though my base color isn’t dark brown/black, my hair pulls warm/brassy VERY easily. I have tried countless purple shampoos that did nothing but dry out my hair and purple conditioners that just seemed like a dash of purple food coloring was added to a cheap mild conditioner. I finally had enough and consulted a new hairdresser (and ironically, my platinum blonde brow groomer in Houston), and they recommended the two MUST HAVES I’m talking about today to truly keep blonde hair ashy FOR GOOD. 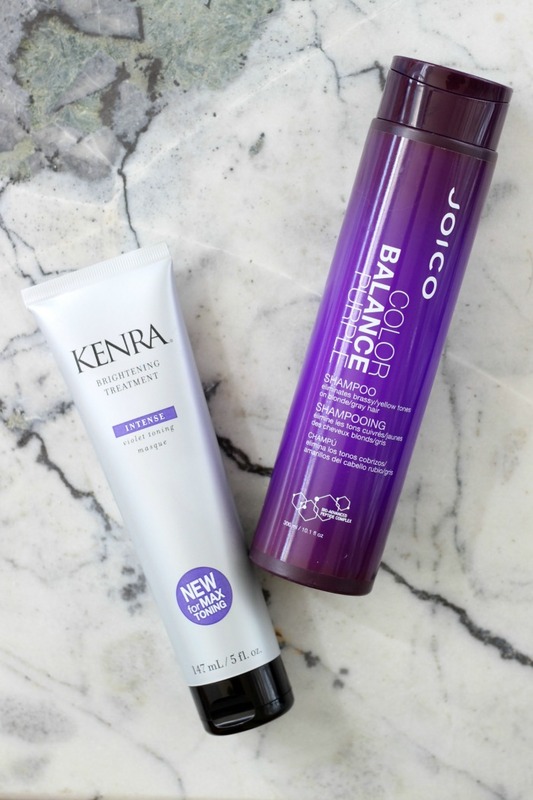 Even with the suggestion of keeping these standard purple shampoo/conditioners in the hair for 5-10 minutes, they never did even a quarter of what the JOICO Color Balance Purple Shampoo and the KENRA Brightening Treatment have accomplished each time I use them. This duo is NOT recommended by me for those who are natural medium to light blondes. This is more for those of you who are naturally dark blonde to medium/dark brunette and currently get highlights/balayage or ombre. 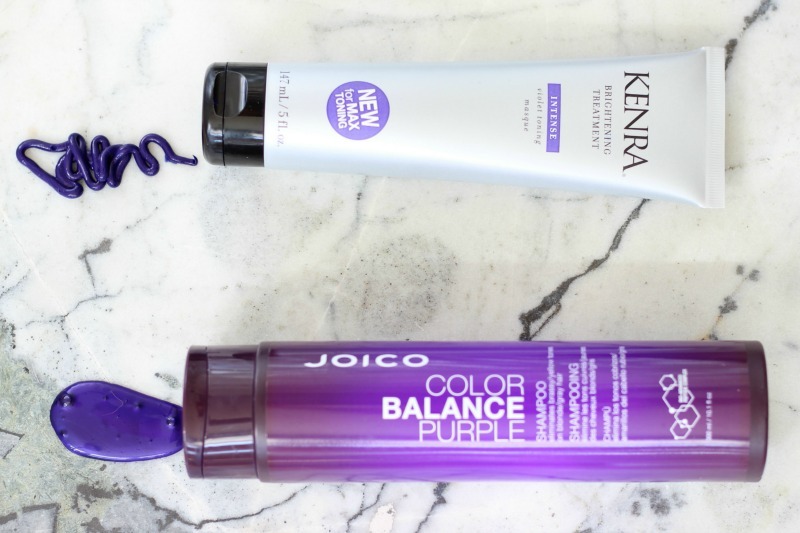 When I first used the JOICO Color Balance Purple Shampoo and KENRA Brightening Treatment, I left each on for about five minutes to get maximum results. Something I noticed immediately in the shower was how conditioning both of the formulas are. I could actually run a wide tooth comb through my hair with the conditioner! A total miracle if you’ve tried as many purple formulas as I have. Second, the toner in these formulas is incredibly potent. I’ve noticed not all of the pigment rinses out of the hair after use (which I think is a good thing) and my towels are (temporarily) stained blue/purple until I wash them. 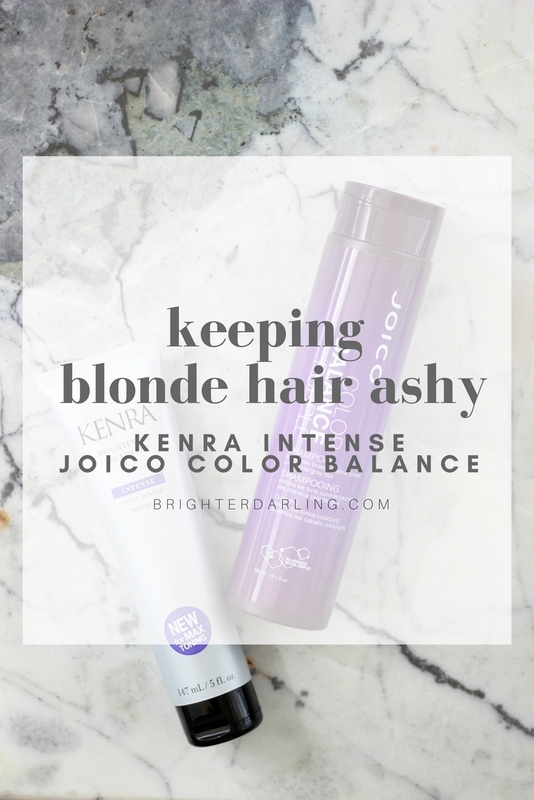 Lastly, the duo WILL brighten/ash out/alter the color of your blonde hair in one use – especially if you leave each formula on five minutes. I believe the difference lies in the color of the toner – if the toner leans too purple and less violet/blue, it won’t totally cancel out the brassy color. More of a blue-based purple will obliterate it. Both of these formulas – particularly the KENRA conditioner – have a strong blue undertone. I now use these two every other time I wash my hair. It has kept my balayage blonde hair looking fresh from the salon – bright, ashy and dimensional – nearly three months after my appointment. "PIXI Skintreats Skincare Review: My Collection + Thoughts"
"Summer Makeup Products I Always Go Back To"